In appreciation for this immortalisation of the city, a park was built with a trompe-l’œil wall on the corner of the eatst bound Old Route 66 and N Kinsley Avenue. A 1970’s flatbed Ford was parked in front of the wall and there is a statue of the songwriter Jackson Brown leaning against a lamp post. The Ford is in all the pictures of the corner on the internet, I therefore presume it is part of the public art on the junction. 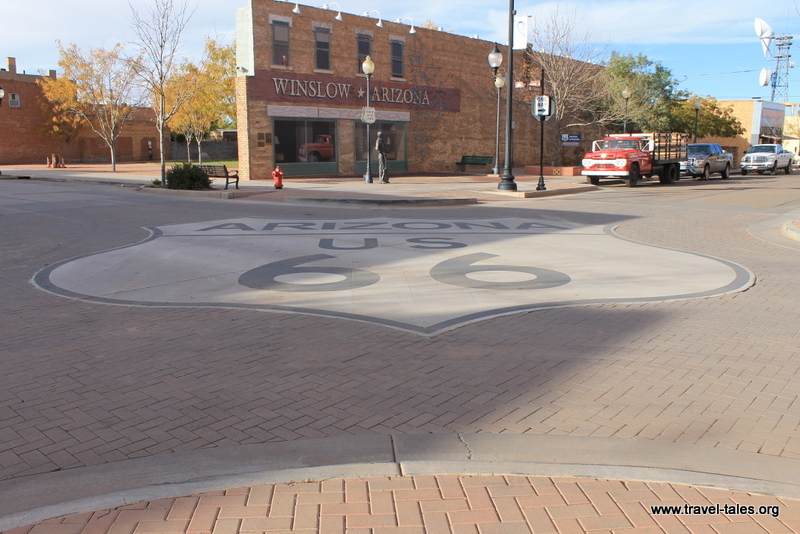 Since the I40 was built, Winslow has reduced in size and is now home to an art gallery, some nice cafes, restaurants and motels, many of which commemorating Route 66. I stayed the night in Winslow and tried (and failed) to capture the amazing sky at sunset. Like at the Grand Canyon, I found the sky in the East as stunning as in the West as the light was fading.